Artist’s depiction of WASP-69b and its ghostly tail. The atmosphere of a gas giant exoplanet located 163 light-years from Earth is being blasted into space by its host star, forming a ghostly tail. Excessive ultraviolet radiation is responsible for the celestial phenomenon, according to a new study, a discovery that could provide new insights into planetary formation. The excellently named WASP-69b is roughly the size of Jupiter, but unlike Jupiter, it’s located a scant 4 million miles from its host star. A year on WASP-69b lasts just 3.6 days. In a new paper published today in Science, astronomers from the Instituto de Astrofísica de Canarias (IAC) in the Canary Islands describe how ultraviolet radiation from the star is blasting helium particles from WASP-69b with such force that the planet’s immense gravity cannot contain them. Incredibly, the outgoing gasses have formed a distinctly comet-like tail, which the researchers were able to detect. Helium may be the second-most abundant element in the universe, but it’s notoriously difficult to detect around distant exoplanets. To sniff it out, a team of astronomers led by the IAC’s Lisa Nortmann used the CARMENES instrument, which is attached to the 3.5-meter telescope of the Calar Alto Observatory in Spain. This tool detects visible and near-infrared wavelengths at high resolutions, allowing astronomers to identify specific chemical signatures, like helium, and the speed at which they’re moving. Using CARMENES, the astronomers observed WASP-69b as it passed in front of its host star from our perspective on Earth, an astronomical technique known as the transit method. Using the same technique, the astronomers observed several other exoplanets in similar predicaments. 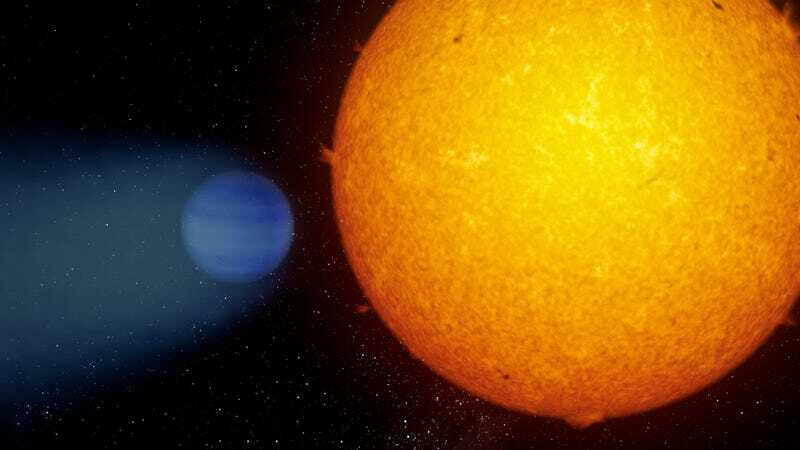 None of the exoplanets observed, however, exhibited the same helium outgassing effect, save for one—a hot Jupiter known as HD 189733b. But instead of featuring a tail, this planet was surrounded by a balloon of helium, which trickled out into space in multiple directions. Artist’s impression of HAT-P-11b, which is so swollen it resembles an inflated balloon. In a related paper, also published today in Science, astronomers describe exoplanet HAT-P-11b, which, like WASP-69b and HD 189733b, is also losing its helium. So this is apparently a thing that happens to a select group of exoplanets. As to why some closely orbiting gas giants bleed out their helium while others do not, however, wasn’t known, so the team turned to a different instrument: the European Space Agency’s Multi-Mirror X-Ray Mission (ESA XMM-Newton). As this telescope revealed, the smoking gun turned out to be extreme levels of ultraviolet radiation from the planets’ host stars. In terms of the mechanism of action, the researchers theorize that the helium particles are getting super-energized by the copious amounts of incoming UV radiation, causing the particles to zip out of the atmosphere and into space. But that’s just the going theory; further observations, especially with the CARMENES instrument, could shed light on this mysterious process. This is all really cool, but this discovery could also speak to the processes of planetary formation. Eventually, the researchers speculate, the gas giants could be completely stripped of their atmospheres. All that would remain is a compact rocky core, featuring densities, and perhaps even masses, similar to Earth or Venus. It may represent a new and seemingly convoluted way for rocky planets to come into existence, but again, it’s still just a theory. With this possibility in mind, astronomers should now look for rocky planets with super-short orbital periods that might be the remnants of this process. Better yet, they could detect gas giants in the final stages of helium outgassing, as that might be considered more convincing (i.e. at cosmological distances, it could be difficult to distinguish rocky remnants of evaporated gas giants from rocky planets that formed via accretion). Thankfully, the next generation of telescopes, including the the Transiting Exoplanet Survey Satellite (TESS) and the yet-to-be-launched James Webb Space Telescope (JWST), may be powerful enough to get the job done.